It’s free. No really, it’s completely free. I’ve been using Pandora internet radio for a couple of weeks now. I hesitated to mention it here because I was afraid that by “free” they meant “free to register” or “free for a little while.” Nope–it’s seriously free. It’s good too, and has one of the coolest interfaces I’ve seen on the web. Not only do they allow you to set up your own stations that you can listen to from anywhere, but by telling Pandora what you like and dislike it also finds new music for you that it thinks you’ll dig. So far it’s been dead on for me as far as suggestions, and I’ve found some cool new music. Pandora allows you to purchase music straight through Amazon or iTunes. That’s where they make their money, which I guess is how they are able to offer the service for free. Since you probably don’t listen to his show, you may wonder exactly what they were talking about. Was it the federal government meddling in the education system? Was it the devaluation of our currency by the Federal Reserve? Was it the triumvirate of big government regulation-happy candidates to which they we have narrowed our realistic choices to? 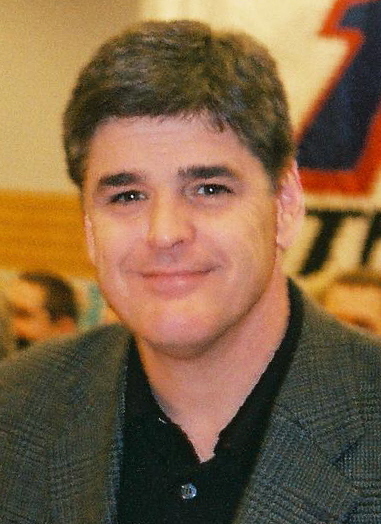 It seems that to Mr. Hannity and his guest, an idiot with a microphone has more right to an opinion than an idiot with a computer. My favorite thing about free speech is that it allows me to speak my mind and spread my ideas if they are good. My second favorite thing about free speech is that it allows every idiot with a bad idea to expose himself as an idiot, and have his bad idea ripped apart. For these reasons, I hope that Mr. Hannity and I both continue to enjoy the benefits of free speech. In my most recent poll, I asked readers to choose the most annoying guy on the radio.Â Fortunately for me, I have a face made for TV and am not on the radio, so I wasn’t eligible. But I don’t think I could have competed with Sean Hannity.Â He completely ran away with the poll, although I’m sure he’d say that was only because a handful of Ron Paul supporters found a way to hack my site and vote several times. Hannity received a whopping 60% of the vote.Â Maybe not all that impressive, but you have to consider than his buddy Rush was also one of the choices.Â At least Rush is funny. I even tried to make it a little more fair by including Jim Rome as a choice, but to no avail.Â Sean Hannity is definitely the most annoying guy on the radio, and you heard ItFrom.Us! If you are feeling more like Bob Cratchit and less like Ebenezer Scrooge Tuesday morning, I’ll be manning the phones with the Knoxville Rugby Club at Dream Connection’s annual Radiothon on WIVK–call in and make a pledge from 7am to 10 am! If you aren’t familiar with Dream Connection, it is an East Tennessee charity that makes dreams come true for local kids with life threatening or chronically debilitating illnesses. Our club just started working with them last year when we did a golf tournament for their benefit, and they are a top notch organization. My favorite thing about this organization is that 100% of the funds they receive goes directly to making dreams come true for kids. No overhead costs–printed materials and the like are donated. No paid positions–everyone involved works as a volunteer solely to help the kids. Call in Tuesday morning and help this great cause! Even though I have to giggle at the word “butthash”…ICK! Yet another reason drugs should be decriminalized. At least it keep a few people from inhaling human waste by choice. Isn’t this the same media corporation news outlet that disabled comments on their website a few months ago because Dr. Paul’s supporters were *gasp* commenting? Didn’t they discount the fact that he did well in online polls with idiotic statements? It’s just like I said earlier, when you start raising real $$$s a different set of people sit up and take notice. Ron Paul received more contributions from soldiers than any other Republican candidate huh? What’s the over under on how many times that will be mentioned by the big time establishment conservative talk radio? I’m guessing you only need one hand to count, but I really hope I’m wrong. Ron Paul vs. Sean Hannity — Psyche!!! Sean Hannity said he was going to have a battle with Ron Paul after the debate. He’d been better off letting sleeping dogs lie. This mental midget should stick with interrupting nervous callers to his radio show and hanging up on the smart ones. Instead, he spent the majority of Paul’s interview pouting in the corner. When he finally piped up, his buddy Colmes helped him out by arguing with him so that he didn’t get embarrassed too badly by Dr. Paul. That’s my spin anyway. Oh well. The less I hear Hannity’s voice the better. Local people will hate me for writing this, and most non-locals won’t get why it’s a big deal. It is really sad funny, but I didn’t know that football season started today until about 30 minutes before the UT game. This is what is considered the real football season around here by the way, not the NFL. I’m risking my status as a Knoxville resident by admitting that I wasn’t really aware and don’t care that much about UT football. Now for the fun part. The start of football season means that it’s time to start listening to sports talk radio again. See, I’m not really a football fan, but I’m a huge “Members of the Knoxville Chapter of Mensa talking about football on the radio” fan. It’s hard to believe the entertainment they provide is actually free. I just checked the scores and saw that the Vols lost, so it should be good this week of radio. The chicken littles will be out en masse, not realizing that win or lose, they still have to go to work on Monday. I’ve never understood how people can get so emotionally invested in something over which they have no control. Maybe that’s it? The fact that they don’t have control is what makes them freak out over it? Dunno. See a common theme here? Tennessee fans do love them a good coach firing!!! I love this time of year! It’s better than Christmas and Arbor Day combined!!! Hurricane Dean…this is getting pretty scary for the folks in Mexico as it looks like it is picking up. I have a friend who really geeks out over hurricanes, and I’ve been encouraging him to start blogging on them. I know he reads this (sometimes), so I’m calling him out publicly now. START! My jaw hurts, but that doesn’t make me ugly. In a move that might make some people scratch their heads, a loosely formed coalition of left-leaning bloggers are trying to band together to form a labor union they hope will help them receive health insurance, conduct collective bargaining or even set professional standards. This is actually the first union I’ve ever heard of that I think is a good idea. Maybe by forming and joining this inevitable disaster, these left-leaning bloggers will realize what a ridiculous idea it is. It may be the only way they ever get it through their thick skulls. Then again, that didn’t really work with liberal talk radio did it? Instead of realizing that their product didn’t appeal to the market, they instead tried to blame the market for not desiring their product. Based on the tendency of unions to discourage actual work, the end result will be that they will blog less. Everybody wins! Think about it, no blogging on weekends, holidays, or after hours. Not to mention the frequent and extended breaks they will take while actually “working”. This idea sounds better and better the more I think about it.